If you want to get in shape fast, burpees are the answer. The burpee is a full body muscle building and cardio exercise. Burpees train your abs, triceps, obliques, shoulders, chest, quads, glutes, hamstrings, calves and your cardiovascular system. After doing a few reps of burpees, you will feel your muscles burning, heart racing and you will be sweating like crazy. Burpee is the staple of my bodyweight training routine. I’ve done tens of thousands of burpees and I can confidently say that it’s the biggest contributor to the physique I have today. I still do them regularly and enjoy the fantastic benefits. Doing burpees is the quickest way to get in great shape. Most people who exercise regularly have almost nothing to show for it. This is why they have to tell everybody that they exercise regularly or they go to the gym. A few weeks after I started doing burpees, all my friends and colleagues were asking me what the hell I was doing to build such impressive arms, seemingly overnight. If only they had seen how my other muscles were growing too, but I don’t walk around naked. After I discovered the power of burpees, I never had to tell anyone that I’ve been working out. People can tell that within 0.1 seconds of seeing me in person. Bodyweight training is an excellent way to build muscle. Burpee is the king of all bodyweight exercises because it’s the exercise that works the most number of muscles in your body at once. Six pack abs are the ultimate indicator of fitness. Burpees help you get six pack abs by rigorously training your ab muscles. All men have a yearning for big, muscular arms. Having thick upper arms depends on your biceps and triceps muscles. Although it’s easier to work your biceps muscles (you can use dumbbells for direct bicep work), triceps muscles are harder to stimulate. If you don’t believe me, try doing 50 burpees now and see how your triceps muscles are burning. I have big triceps muscles today thanks to burpees. Longing for abs and triceps muscles doesn’t mean that the rest of your muscles are not important for your body. Your body likes to grow as a whole. That’s why I always prefer to train with full body exercises. Besides your abs and triceps, burpees build your obliques, shoulders, chest, quads, glutes, hamstrings, and calves too. Burpee is a high-intensity exercise. High-intensity training (HIT) is scientifically proven to reduce body fat, waist size, and visceral adiposity. It does all these things significantly better than conventional training. HIT has also been shown to be very effective at increasing insulin sensitivity which helps prevent or fight type 2 diabetes. Furthermore, high-intensity training is shown to burn more calories during training compared to aerobic exercise and resistance training. One of the most important parts of obtaining and maintaining fitness is your muscle mass. Muscles are calorie burning machines and burpees build muscle all over your body which helps to burn more calories and body fat. I confess that I didn’t care about cardio when I started doing burpees. I just wanted to build a strong, lean body with six pack abs. But, I quickly recognized the cardio value of burpees because your body works as a whole and your cardiovascular system is an important part of building muscle. Your muscles need oxygen to grow. They get their oxygen from your cardiovascular system. When you do just a few burpees, you will feel your heart racing, and you will be breathing heavily. This is your cardiovascular system at work. Physiologists found that HIT increases cardiorespiratory fitness incredibly quickly. Burpees are the finest way to do high-intensity training so doing burpees will skyrocket your cardiovascular fitness in no time. Increased cardiovascular fitness and muscle mass, and decreased body fat will greatly improve your endurance, stamina, agility, athleticism, balance, coordination, and total body strength. Burpees require no gym or equipment so you can do them everywhere. You don’t want to go to the gym? -No problem. Do some burpees at home. -No problem. Do some burpees in your hotel room. Do you want to train in the open air? -Go to a park and do some burpees. No treadmill, exercise bike or an elliptical machine. If you can push yourself through 150 burpees, there is little else in life that you can’t achieve. Discipline and mental toughness are indispensable qualities of a great man. Doing burpees is a great way to acquire them. When you build your muscles up, burn body fat, and increase your cardiovascular fitness, you will be able to jump higher, run faster, throw better, and kick harder. You will have better balance, endurance, and stamina. All of these will translate into better performance in any type of sports you might be engaging in. Doing burpees will also increase your capability in doing push-ups, pull-ups, sit-ups, sprints and any other kind of strength training exercise you can imagine. Have you ever noticed the glow on the faces of your favorite athletes? It’s because they are sweating their toxins off their skin. Burpee is a high-intensity exercise. Doing them will make you sweat. Sweating will remove the toxins from your skin, which means that your skin will be glowing like a newly born baby. Doing 50 burpees will train your body more than 30 minutes of running or one hour of walking. When you are used to doing them, 50 burpees will take you 5 minutes at most. When I built my six-pack abs, I trained 2 hours a week on average. I pity the people who waste hours after hours on the treadmill with no tangible results to show. Ditch the treadmill and switch to burpees. You will save a lot of time. Exercise is known to increase the happy chemicals (endorphins) in your brain. Burpees will exercise your body so strongly that you will feel the endorphins rushing to your brain almost immediately after you start doing burpees. That’s a natural and healthy high which no drug in the world can give you. A proper burpee is the one with the push-up movement included. What If You Are Unable to Perform Burpees with Proper Form? Doing a proper burpee is tough, especially when you are too out of shape. That shouldn’t stop you to benefit from burpees. You can start with the easier version of burpees where you skip the push-up part. Sometimes you will be able to do proper burpees up to a point but you will get too fatigued to do more proper burpees. For example, let’s say that your training routine requires you to do 100 burpees. You do 20 proper burpees and you cannot do it anymore due to fatigue. Don’t fret and don’t give up. Do the rest of the 80 burpees without the push-up part. Completing your training is the most important thing you should aim at. When you don’t give up easily and keep completing your training even with the easier version, you will see that you will be able to do more and more proper burpees. Your improvement with burpees will be rather quick, so a little patience will go a long way. While burpees are awesome, they will exhaust you rather quick. If you aim to build a lean, muscular, and athletic body, add some other compound bodyweight exercises such as push-ups, pull-ups, and squats to your workout routine. If your workout involves burpees, make them your first exercise. Burpees are superior to other bodyweight exercises so it’s best to do them first when you are fresh. 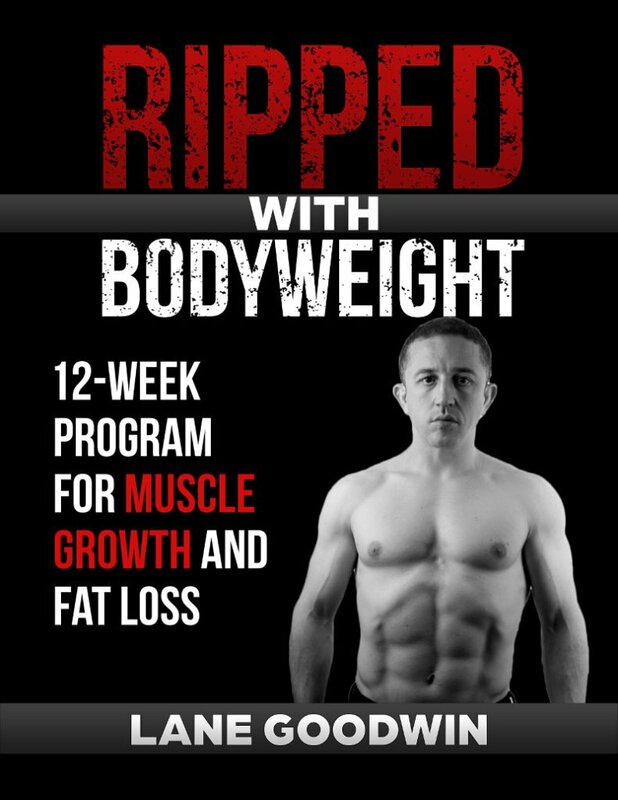 If you are looking for full-fledged bodyweight workouts that include burpees, feel free to check out Ripped with Bodyweight. For decades, the mainstream establishment has pushed long distance running as the ultimate form of exercise for getting into shape and gaining cardiovascular fitness. Before discovering the power of bodyweight training, I used to run. I ran for years with nothing to show for. I was fat, weak, and grossly out of shape. In addition to that, running takes a lot of time and it’s extremely boring. After I switched to bodyweight training, I quickly started to get in shape. The changes were happening incredibly fast and everyone around me was asking questions about my training routine. The answer was high-intensity bodyweight training. Burpees were the staple of my training routine. The best part of all is that I trained less than 3 hours a week. At the time I started bodyweight training, my workplace was 1 hour of driving away from my house. I was waking up at 6 am to go to work and coming back home after 7 pm but I still was able to find the time to train. Less time required to train and incredibly fast results made me fall in love with high-intensity training and from that time onwards, I never looked back. Now, I pity the people who run outside or toil away hours on the treadmill or the elliptic machine. High-intensity training is vastly superior to running in terms of body composition and cardiovascular fitness. You don’t build muscle by running, which means you stop burning calories the moment you stop running. Running also takes too much time, it’s boring, and the results are poor. High-intensity training is superior to long distance running not only in terms of cardiovascular fitness but also in terms of building muscle and burning fat. Moreover, it’s time efficient, so it removes the biggest excuse people have when they don’t exercise. Burpees improve your body composition by building muscle and burning fat. As you get in great shape, your health will improve. As your health improves, the quality of your life will improve. Even your sleep quality will be better as you will be fit and you breathe better. Many fit people have a skin and bones look when they lose weight. Not with burpees. Since you will build muscle, you will get the athletic, toned build which everybody desires. Getting an athletic and toned body will improve your attractiveness which will be enhanced by having a vibrant skin. Burpees eliminate the excuse of no time for training. They save you time because your training sessions will be short and the results are incredibly quick to come. Burpees save you money because you don’t need to join a gym or buy exercise equipment. With burpees, you will build discipline and mental toughness. Burpees will help you build a body you can be proud of. When I started doing burpees, my goal was to get six pack abs. 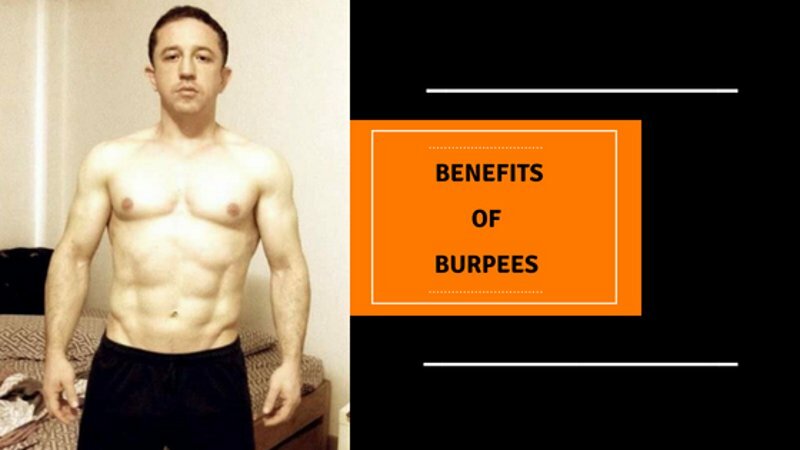 Burpees helped me achieve my goal rather quickly and I enjoyed many other benefits which blew my mind. Start doing burpees today. You will not regret it.